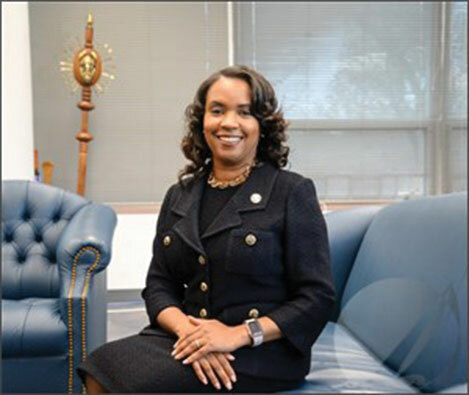 ELIZABETH CITY – Dr. Karrie Dixon is now serving as Elizabeth City State University’s new interim chancellor. She was appointed interim chancellor by University of North Carolina System President, Margaret Spellings. The appointment was made after Chancellor Thomas E.H. Conway, Jr. announced his retirement last February. Conway will remain at ECSU in an advisorsy capacity until his official retirement date, May 31. Dixon has worked closely with Dr. Conway, preparing ECSU for a strong future as one of North Carolina’s 17 public institutions of higher education. The Winston-Salem native has served as a senior administrator for the UNC System since 2008. In 2014 she was named the Vice President for Academic and Student Affairs, overseeing the Division of Academic and Student Affairs for the system’s 17 institutions. As ECSU’s interim chancellor, she brings with her experience in providing university-wide guidance for policy, shaping the work and practice of academic and student affairs for some of the nation’s top-ranked institutes of higher learning. Dixon has also served as the UNC System’s Chief of Student Affairs Officer. In that role, she worked closely with vice chancellors for student affairs and university leaders, focusing on enrollment and minimum admissions requirements, community college transfers, military student success and campus safety. She has also served a combined 10 years at two UNC campuses. Most recently she worked as an assistant vice provost at North Carolina State University and is currently an Adjunct Assistant Professor at the College of Education’s Department of Leadership, Policy, Adult and Higher Education. Dr. Dixon holds a bachelor’s degree from N.C. State University, a master’s degree from the University of North Carolina at Greensboro, and a doctorate from N.C. State. She is a graduate of Winston-Salem’s Carver High School.